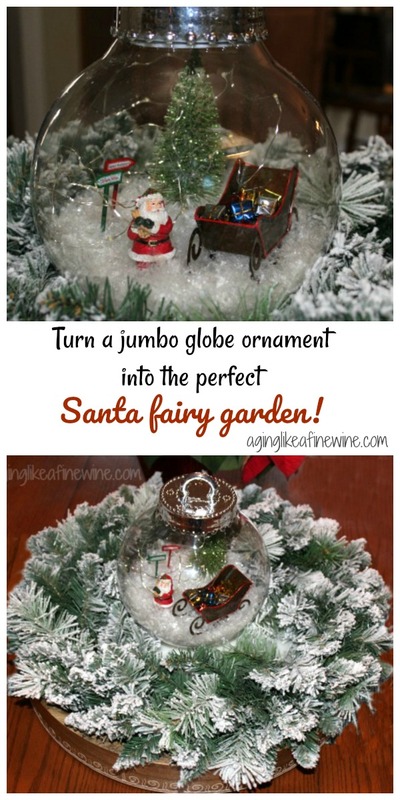 Turn a Large Globe Ornament into a Fairy Garden; Easy, Fun and Charming! 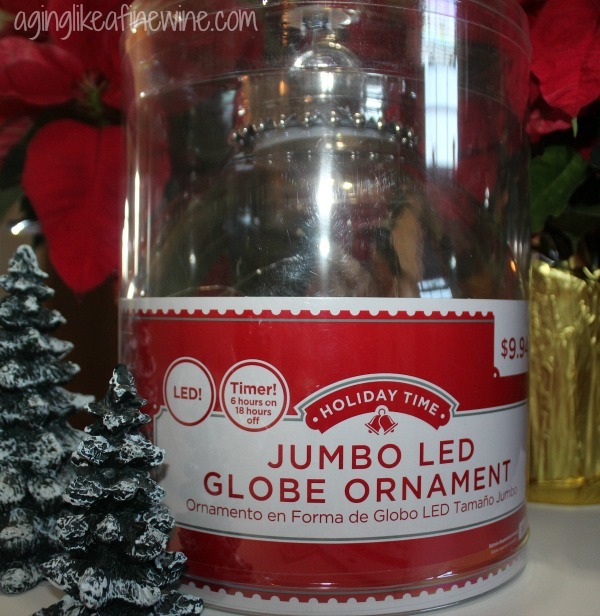 Last week I was strolling through the Christmas decoration aisles at Walmart and I happened to see this Jumbo LED Globe Ornament on the top shelf. I instantly thought “fairy garden” and knew I had to take it home with me. So after struggling to get it off the top shelf, it became mine! My plan was to fill the bottom with snow and add some fairy garden items. I hate to pay full price for things and these items were 70% off at Michael’s on the day I purchased them. 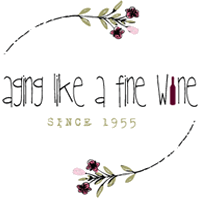 With a little patience, you can almost always get a good deal on seasonal items at the craft stores. 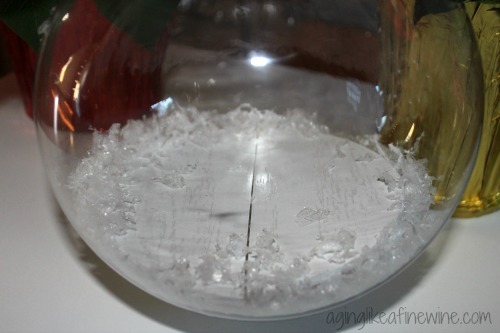 First, of course, I took the lid off the globe and put some of the snow in the bottom. At this point, I tried to sit my fairy garden items into the globe, but they were practically covered with snow and there was no stability. I knew I needed a stable flat surface to set my items on. 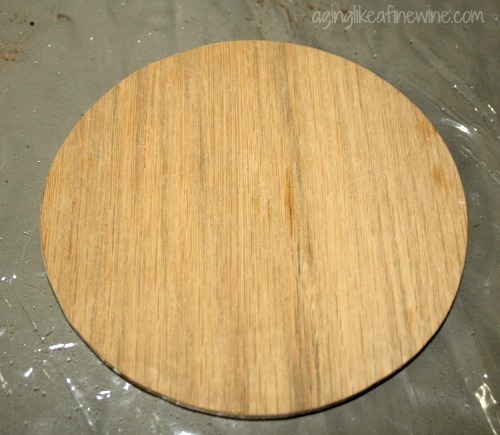 I had a round wooden disk that had been laying around here for months (my husband had cut it out for me for another project that never came to fruition). I thought it would be the perfect size if I could get it inside the globe. 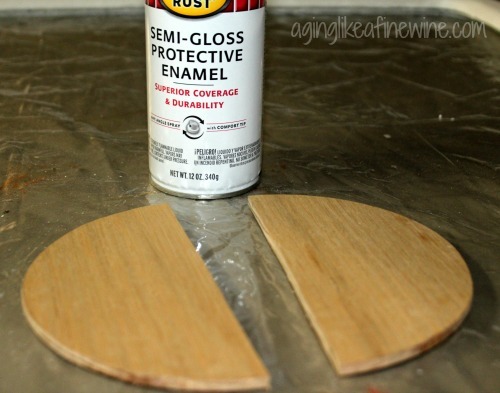 You can buy round wooden disks at Walmart in the craft section for $1.00 that would be the perfect size for this as well, or simply use a sturdy piece of cardboard. 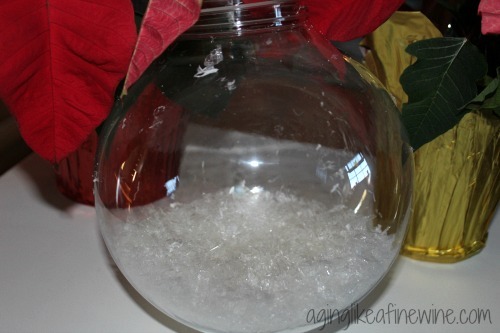 It could be folded and inserted, then easily straightened out inside the globe. 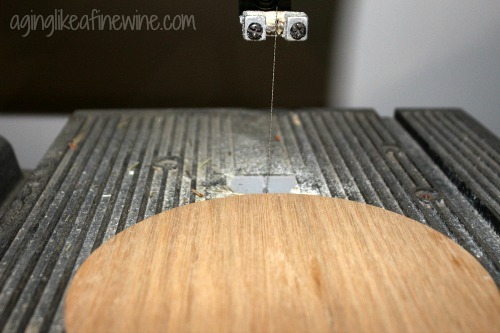 To be able to get my disk inside the globe, I used a band saw to cut it in two. Next, I spray painted it white so that it would blend in with the snow. I then tried putting it into the globe, but it was a little too large which meant a second trip to the band saw to cut just a little off each piece. The wood pieces slipped into the globe with a little push and were perfect. Next, I put some snow on top of the disk and started putting my fairy garden items in. 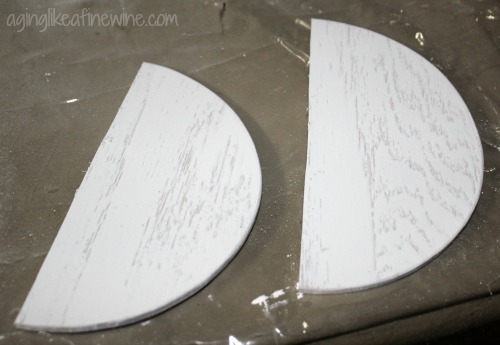 Everything except the sleigh fell over repeatedly, so I grabbed some craft glue and starting with the tree glued each piece to the wooden disk. Still no luck, the craft glue just wouldn’t hold them stable. Next step, one of my faithful old glue guns. 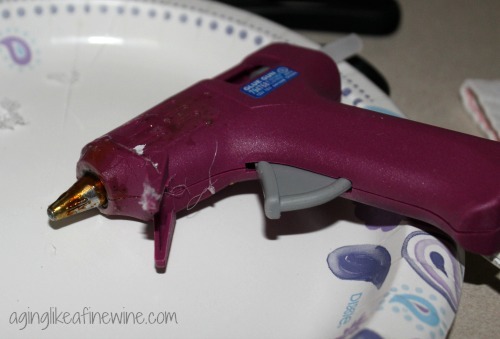 I love my glue guns, nothing works as well. After everything was glued in place, a little more snow was added, the lid replaced and a cute little Christmas fairy garden created! 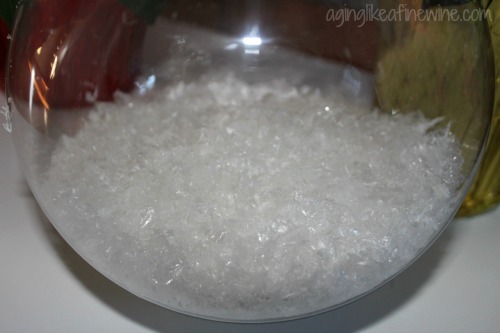 I put some tissue paper in a bowl and set the globe down in it to hold it secure while I worked on it. To display my fairy garden I first placed a wreath in a large wooden bowl. 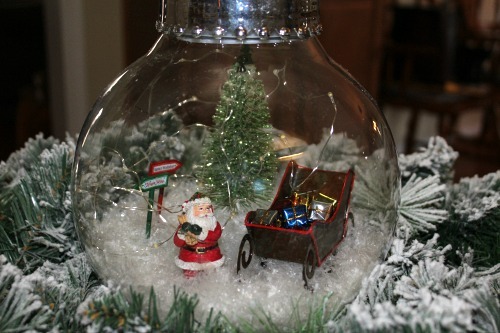 Next, I placed the globe in the center so it would be cradled in greenery. And it now happily resides on my kitchen table. I have another resident fairy garden and my grandchildren love to play with the little items in it, frequently arranging and rearranging them. Tell me, do you have a fairy garden? 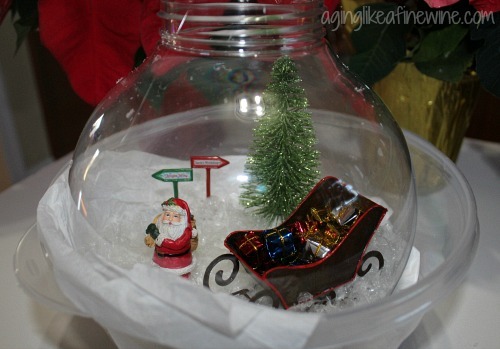 Have you ever made a holiday-themed fairy garden? This is delightful. I have toyed with the idea of creating a fairy garden but have never seen a similar Christmas version like this! What incredible patience you had slipping everything into the large ornament (in some cases, over and over). And love the way you displayed it in a nest of greenery. Just beautiful. Thank you Leslie! I am using it as the centerpiece on my kitchen table and really like it. My grandchildren have now added some of their lovely painted and decorated pinecones to the greenery, which makes it a little more special. Thank you for stopping by!